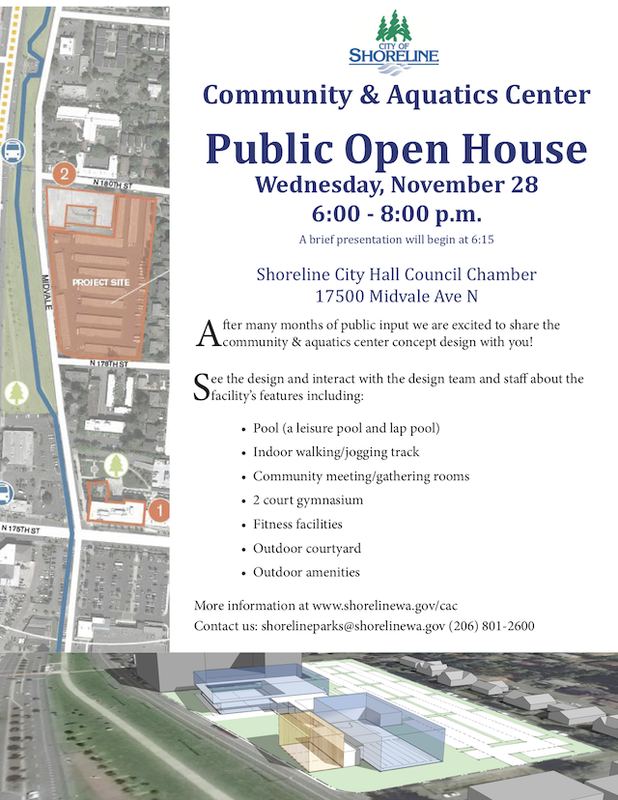 The City of Shoreline will hold a public open house on Wednesday, November 28, 2018 to share the concept design for the planned Community and Aquatics Center. The Center will be located near City Hall on Midvale on land currently occupied by a large one story storage unit facility. The open house will be held from 6 to 8pm with a brief presentation at 6:15pm. The design, which was prompted by the failing condition of the Shoreline Pool, does not include a diving well or a pool big enough for the high school swim teams, nor does it have accommodations for the Senior Center. It does expand on facilities currently available at the Spartan Center, which it would replace, and a "leisure pool and lap lanes." Also, an indoor jogging track, fitness facilities, and a two court gym. A Parks Funding Advisory Committee has been appointed and is currently meeting.